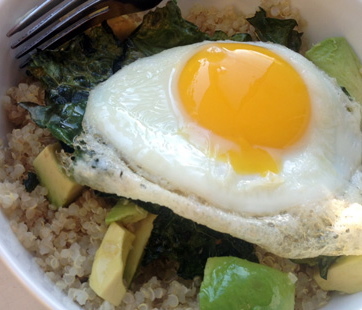 This fast and easy meal is packed with protein and nutrients pregnant and new mamas need. The quinoa, a grain that can be purchased at most grocery stores, is vegan, gluten-free and a complete protein. The kale packs a big punch of vitamins A, C, and K, omegas, and calcium. It has more iron than beef. The avocado is a heart-healthy fat and contains fiber, potassium (more than twice the amount found in a banana), vitamin E, B vitamins, and folic acid. The eggs, considered "brain food" for your baby, are a great protein source and contain cholesterol, essential fatty acids, calcium, iron and vitamins A, D, E, and K, which babies and mamas need. This recipe serves one, so feel free to multiply the recipe, or make more quinoa ahead of time to make meal preparation even easier. Dizzle kale with olive oil, sea salt, and pepper and place on baking sheet prior to roasting. Roast kale for 12-15 minutes, turning at least once throughout the process. In a serving bowl, mix 1/8 cup olive oil with lemon, sea salt, and pepper. Add quinoa into in olive oil mixture. Fry egg over medium heat, about 3 minutes each side, season with sea salt and pepper, and place on top of kale. Splash a drop or three of your favorite hot sauce on top. Cut into egg and mix all these happy, healthy ingredients together.